Let's look briefly into the history of Black people in Latin (Central and South) America and the Caribbean. 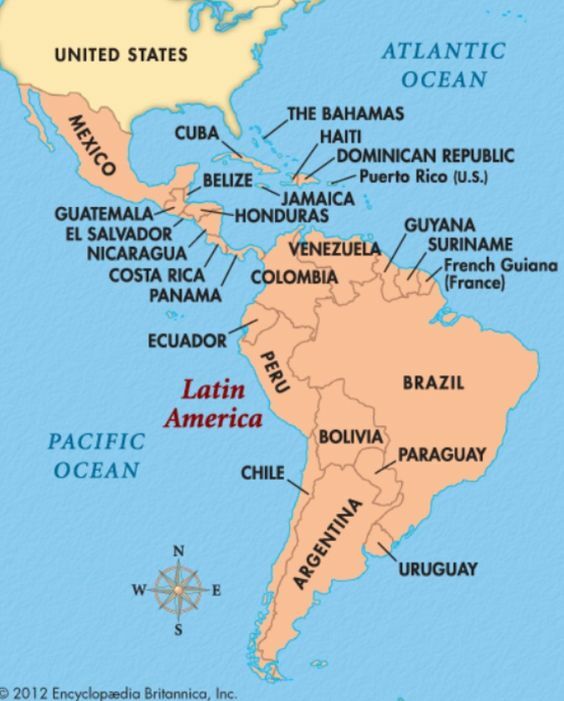 In world history these two western regions were the first areas of the Americas to be populated by African immigrants. Yet wherever possible, they prepared and accepted reality with the African immigration to the Americas may have begun before European exploration of the area. African slave trading began before Columbus, and the earliest Spanish and Portuguese explorers. The most direct route from West Africa to the (then) New World was to what we now know as Brazil. 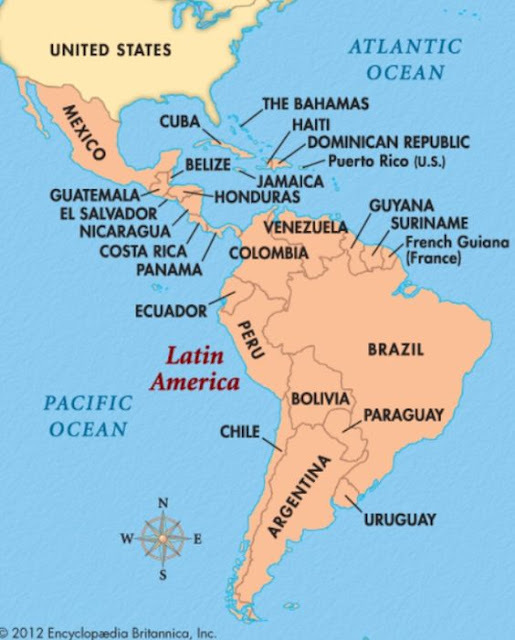 Through the 15th and 16th centuries, slavery then moved up the coast of South America through the Caribbean. In fact today the largest population of African people outside of the African continent is in Brazil. The explorers were likewise accompanied by Black Africans who had been born and reared in Iberia. In the following four centuries millions of immigrants from Africa were brought to the New World in servitude. Today, their descendants form significant ethnic minorities in several Latin American countries, and they are the dominant element in many of the Caribbean nations. Over the centuries, Black people have added their original contributions to the cultural mix of their respective societies and thus exerted a deep influence on all facets of life in Latin America. A strong African influence saturates music, dance, the arts, literature, speech forms, and religious practices in Latin America and the Caribbean. Africans, whether as slaves or free immigrants, brought a variety of African cultural influences to the New World. They came from so many places in Africa and were too scattered throughout the Americas to reestablish all the conditions of their homelands. Like all other immigrant groups, they discarded some aspects of their culture, modified others, and created new forms. This African adaptation to local American conditions is called creolization. The percentage of Africans in local society and the time they spent in any one place played in the development of an African (central or south) American culture in Latin America. In countries such as Argentina, Brazil, and Mexico, African immigrants were the minority. They had to deal with a significant and dynamic form of European society and culture. The African communities survived, and in some instances grew against the stiff and relentless competition of the majority, or "high," culture. Pieces of the African ethnic subculture were eventually adopted by the mainstream. Nonetheless, the African character of the African American culture is less pronounced than in societies where Blacks were the majority of the people. In the plantation societies of the Caribbean islands, people of African ancestry held substantial control over their daily lives, despite the efforts of the politically dominant minority group to restrain and oppress them. The lack of cultural homogeneity as well as the laziness of the plantation elites provided an almost unique opportunity for the African masses to create their own society and influence the "high" culture. Caribbean people speak variants of the standard European languages, which always reflect West African speech patterns regardless of whether the spoken language is English, Spanish, French, or Dutch. The French spoken in Haiti constitutes a language of its own. In Curaçao, Aruba, and Bonaire, Papiamento, a blend of Dutch, Spanish, and Portuguese, is one of the official languages. None of these Creole languages is limited to the poorer, uneducated classes. Creole has now been given greater respect in the literature and political life of the Caribbean islands. As a distinct minority the beginnings for African people in the Americas, brought on cultural change in their lives. Official acceptance modifies some forms of culture and for Blacks in Central and Latin America life was no different. The carnival is an example. Until the 19th century, the annual celebration of carnival was confined to the Black population; the upper classes condemned carnival and tried to end it as a public festival. By the early 20th century, however, it had attracted all classes and races. Currently it has official government support in the Bahamas, Cuba, Trinidad and Tobago, and Brazil. Although carnival has become highly regarded, and its festivities are open to all races and classes, the chief participants of these carnivals are still Black. The same remains true for other folk festivals such as the Jonkonnu in Jamaica. In some cases, however, the transition from low to high culture buried the African origin and influence. An example is Argentina where the tango (dance) was developed from dual African ancestries. One source is undoubtedly the Spanish fandango, but the fandango is really Moorish. The other source is a Black dance called the candombe, the feature attraction of Afro-Argentine festivals during and after the period of slavery. Latin American music has always been deeply influenced by the vibrant rhythms and melodies that Blacks brought with them from their African homeland. This is particularly true of Brazil; in fact, the first real music school in that country was founded by a Black priest. Brazilian music is thoroughly filled with African themes, and well-known composers such as Heitor Villa-Lobos have long found inspiration in the Black musical heritage. Many Caribbean musical styles have become widely known, including the mambo from Cuba, salsa from Puerto Rico, reggae from Jamaica, and calypso from Trinidad. As is expected, spirituality and religious practices were distinct factors in the cultural adjustment for Blacks in Central and Latin America, and the Caribbean. Regarding religion, African immigrants to Latin America and the Caribbean not only retained some of their original beliefs but also borrowed and modified religious rituals from the various European Christian churches they encountered there. Religious affiliation, however, is no longer restricted by race or color. A number of Christian groups such as the Seventh-day Adventists, Pentecostals, and Churches of God are predominantly Black. However, religious sects of African origin—such as the vodun in Haiti (see Voodoo); Shango in Trinidad and Tobago, Venezuela, and Brazil; Santería in Cuba and Puerto Rico; Kumina, Myal, Revivalist, and Ras Tafari in Jamaica; and Umbanda, Macounda, and others in Brazil—are no longer only Black. Black people have left a deep impression on the teachings and literature of the Caribbean, Central and South America. In some parts of Latin America, such as Brazil, well-liked tales and legends are to a great extent of African origin. Themes dealing with slavery have always been popular with Black writers. Some, such as the Brazilian poet Luis Gama, were also active in the abolitionist movement. Antonio de Castro Alves was identified as the "poet of the slaves" for his treatment of slavery in his writings. João da Cruz e Sousa, the son of emancipated slaves, is considered one of Brazil’s greatest poets. As nationalism intensified during the 20th century, even more attention was given to African origins. The Haitian poet Jacques Roumain stressed the value of his native (African) culture, while expressing the pride and bitterness of his Black ancestry. Nicolás Guillén, one of Cuba’s most eminent poets, wrote some of his best works as "Black" poetry based on the rhythms of Afro-Cuban music. Many novels, poems, dance, and mime of Latin America and the Caribbean incorporate African speech patterns, styles, or concepts trying to express the spirit of the Black cultural heritage. In the Nobel Prize-winning poetry of Derek Walcott and the autobiographical short stories of Jamaica Kincaid, one can read reconciliation with the differences between the writers’ native West Indian and adoptive white environment. Geopolitical migration still remains a pillar of African presence in western hemisphere below the United States. The Maroon settlements in the days of slavery were (in reality) Black states. They had communities in North, Central, and South America. They were, in effect, states within states. Haitian slaves led by Jean Jacques Dessalines captured the governing apparatus in 1804. This was only the second independent country in the western hemisphere (at the time, the first being the United States) and the first one ruled by Blacks. Haiti became a symbol of Black independence and a catalyst for 19th century Black Nationalism. Blacks in many other countries were involved in politics but in some nations such activities were restricted. After 1911, Cuba, for example censored the organization of political parties based on race or color. The Cuban government also suppressed the military efforts of the Afro-Cuban leaders Pedro Ivonet and Evaristo Estenoz to reverse that political decision which ended in tragedy in 1912. Government troops killed 3000 Afro-Cubans in Oriente Province, putting an end to Black political resistance in Cuba. In São Paulo Brazil, the Frente Negra Brazileira (Brazilian Black Front) was founded in 1931. It served as the national political voice of Afro-Brazilians, but ended along with other political parties during the Vargas dictatorship of the 1930s and ‘40s. In the British, French, and Dutch Caribbean, Blacks have participated in politics for more than a century, and today hold local political power. Governments controlled by people of African ancestry have been in power in the Netherlands Antilles, Trinidad and Tobago, Barbados, Saint Lucia, Grenada, Saint Vincent and the Grenadines, Dominica, Antigua, Saint Kitts and Nevis, and Jamaica. The Marxist government of Cuba has acknowledged Cubans an Afro-Latin American people and has formed close relationships with Angola, Ethiopia, and other African states. Other Caribbean countries have also established contacts with the free nations of Africa directly and through United Nations agencies and other international organizations. These Caribbean-African collaborations have been based on shared ideology than on race or color. Today throughout Latin America, Black communities are asserting themselves after years of marginalization and apparent invisibility. In Brazil, where Black and mixed-race people make up more than half the population, two breakthroughs are indicative: the election of the first Black mayor of Sao Paulo and the appointment of Pele, the beloved former soccer star, as minister of sports. Blacks in other Latin nations are making their presence felt. Colombia recently elected to Congress politicians who emphasize their African heritage rather than deny it, as in the past. Blacks from Costa Rica to Peru to Uruguay are increasingly active in politics and new organizations that promote Black culture. The rise in activism results partly from economic and political stability, which allows the social order to concern themselves with the disadvantaged and the disadvantaged to press their demands. The progress of African Americans in the United States also has influenced Afro-Latins through the media. In one of the few regional studies of its kind, the Inter-American Development Bank published a report in 1996 estimating that as many as 150 million Latin Americans, about a third of the region's population, are descendants of African slaves. Other estimates are lower because many people of mixed race do not define themselves as Black. For further reading see below links, and check on History and Cultural Relations. Afro-Hispanic Pacific Lowlanders of Ecuador and Colombia. Editors: Kwame Anthony Appiah and Henry Louis Gates Jr.